I am a slave to Pinterest. Especially when it comes to clothes, makeup, nails… things I’m normally mildly clueless about. If you find me on Pinterest, you will find an entire board dedicated to just hair styles and makeup, mostly I am constantly looking for ways to curl my hair. My hair doesn’t hold a curl. Don’t join the 23 years of hairdressers and friends in a dorm room with an expensive straightener and tell me “I can make it curl, they just didn’t do it right.” You’ll just look silly. It doesn’t curl. It falls in 10 seconds or less. Out of the beach wave tutorials on my Pinterest, I have actually tried all of them, as opposed to just pinning it and never looking again. Half of them leave my head partially curled, then the rest slumped and weird looking, the other half turn my head into a frizzy nightmare that can’t even look acceptable in a bun. 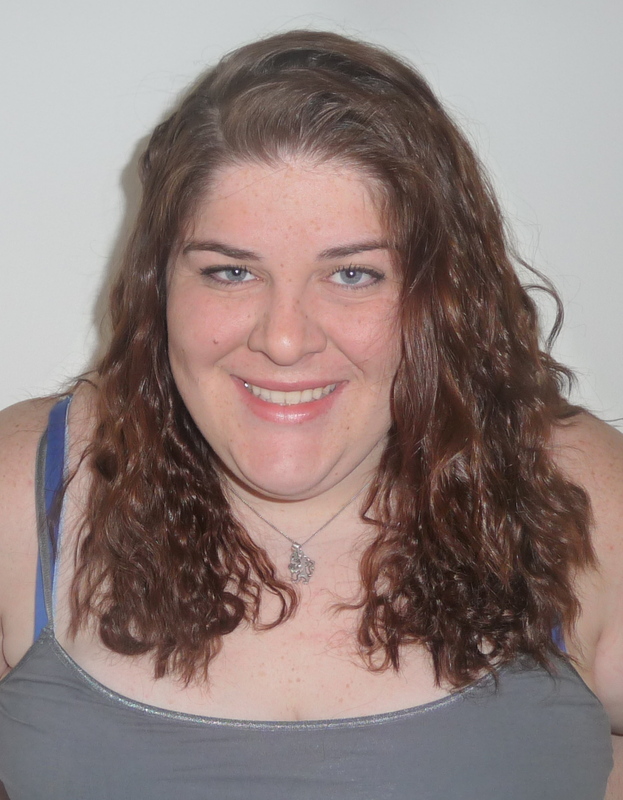 So I’m sharing with you my beach curls that I’ve been using for years that actually works. And they’re legit, because I actually got this idea from going to the beach! When I had really long hair it would get knotted up from the waves, so I would French braid my hair into two braids before heading out. Then, when it dried I would take it out and have these amazing waves that actually lasted all day. So here is my super easy, super effective curly/wavy hair tutorial for girls who can’t get it right. 1. Add a small amount of product to the bottom half of wet hair. By wet I mean as soon as you get out of the shower. I use Herbal Essences Tousle Me Softly mousse, mainly because it’s crazy cheap. Sure, you can use more expensive products… but why bother? It’s not like I’m styling my hair all the time. If you dont have any products try adding a few tablespoons of salt to warm water and wetting your hair with that. After all, this is a beach hair inspiration, salt water was kind of what got this idea into my head in the first place. 2. Divide your still wet hair into 2-6 equal parts. The more divisions you make, the tighter the waves will be. I chose six, to get more of a curl and less of a loose wave, but usually I divide it into four. Plus, I always do this at night, right out of the shower and about an hour before I go to bed. That gives me 8 hours for my hair to dry. 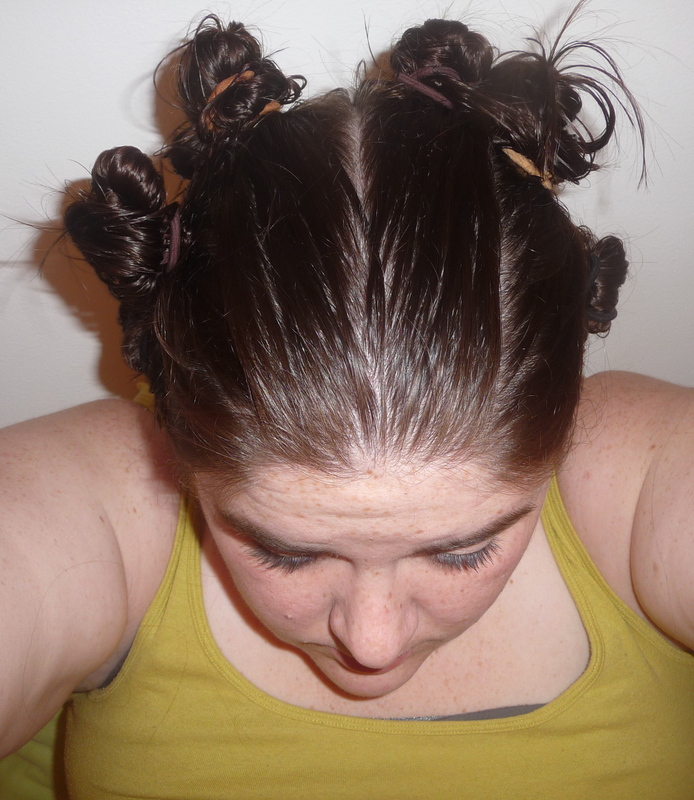 If you want your hair to stay clean and ready for night time, try doing two parts. The easiest way for me is to split my hair into a middle part like I was making pigtails, then divide each half into their own halves. Tie all of the parts off with their own hair tie. 3. French braid each individual section of your hair. Now here’s the thing: I am completely clueless when it comes to hair. I can do a basic ponytail, I can pin the front back with a bobby pin, and I can french braid. That is all I know how to do. If you are awful at everything like me, I guarantee you that you can learn to French braid your own hair. It is much easier than it looks, and there are 200 tutorials on YouTube and Pinterest. Once you learn a french braid, you can do so so much! Including this tutorial. When your hair is done all it has to do is dry. When I want this to be clean and ready for the evening I use two braids, and pin the two braids back so that it looks like a neat style on the lower back of my neck that I can wear to work. 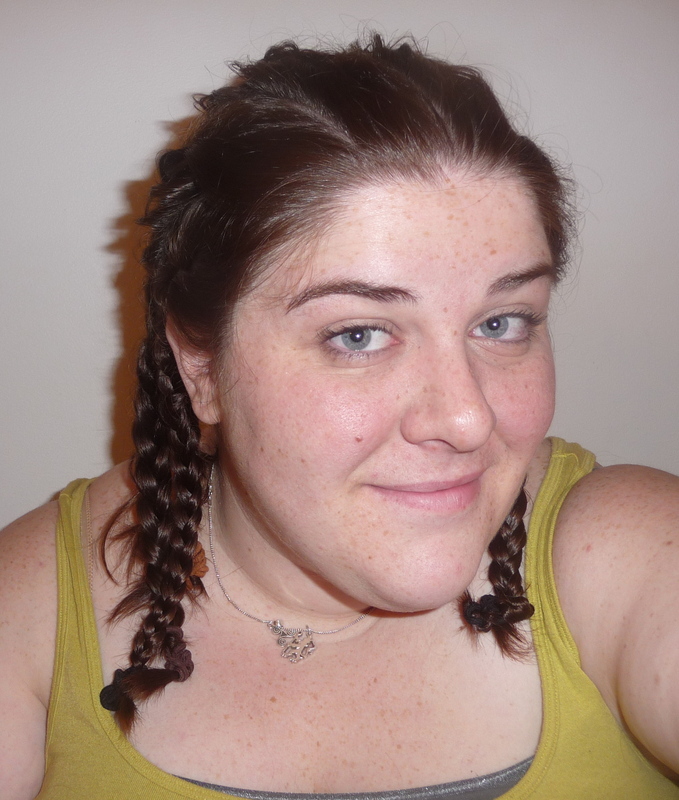 Plus, once you braid your hair into more than two braids you kind of look like Snoop Dogg… and that’s awesome. 4. When your hair is dry, unbraid and voila! It takes about 8 hours for particularly thick hair like mine, but for thinner hair it might take 5-6. No product needed at the end, it should last all day! Below is this mornings’ results, awkward smile and everything! You have to try this out. It’s so easy, especially when compared to all the crazy ideas to get the same results that people put on Pinterest. Comment if you have any questions, or if you want to know which tutorials I have tried that have crashed and burned miserably. New, amazing Sir Paul McCartney single with the always undeniably beautiful Natalie Portman signing through it? Why, yes please! When I see a beer that advertises some sort of fruit in it I can’t help but get excited. My sweet tooth does backflips. They usually don’t meet my expectations, however. Then I stumbled on the Lancaster Brewing Company. 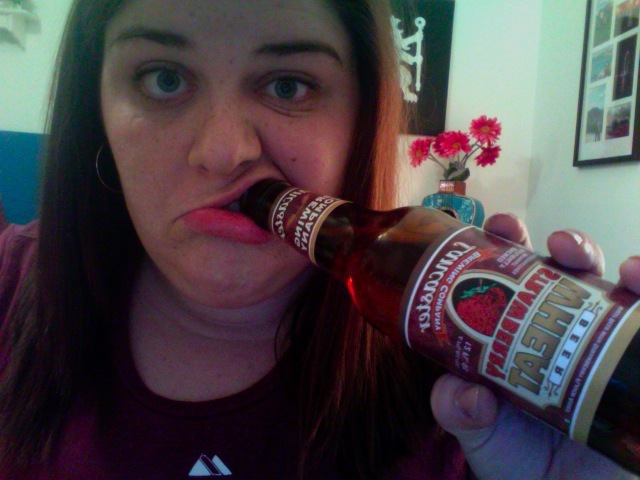 They make a Strawberry Wheat Beer that I fell on tonight during a trip to the liquor store. It is fabulous. Just a hint of strawberry taste combined with the beer. Gosh. I’m in heaven. I don’t even like strawberry flavors that much and I love this. Definitely give this a try. It’s perfect for a nice sunny weekend or when you want to settle in and watch baseball. Since it’s baseball season… finally! Categories Cuisine, Favorites, Girl Power, Try This! when in reality most of my travel time was spent eating Nutella sandwiches, drinking 3 euro bottles of wine and sleeping in hostels. So many things stick with me from that trip. Landscapes that I sometimes still can’t believe I actually experienced. 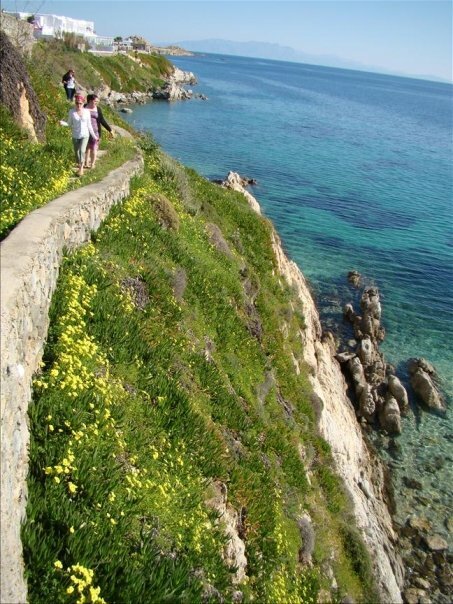 I’ll think of scaling cliffs in Mykonos and get chills. Priceless, precious memories that I wouldn’t trade for anything. And then of course, there’s the food. Since visiting Athens and Mykonos I have become obsessed with Greek food, particularly lamb kebabs which were also a big meal in England. They are the ultimate form of perfection. I can’t even do them justice with words. Since I am unfortunately not Greek, I don’t have the secrets of Greek cuisine. 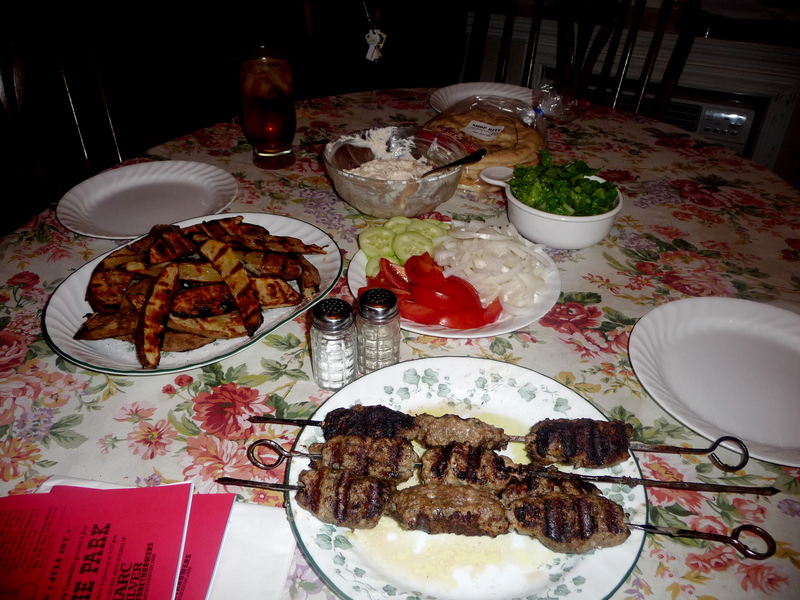 But Alex and I have put our heads to the cutting board and created an Americanized version of the lamb kebab that is really simple and really delicious, especially in the summer. Opa! 1. 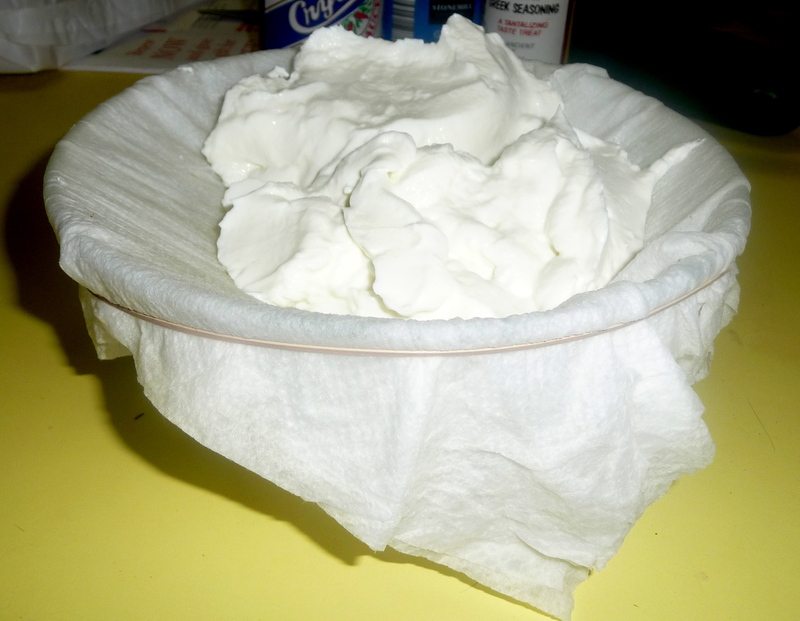 Strain the liquid out of your Greek yogurt for about two hours. Now fancy Food Network stars will tell you to do this by purchasing $4 worth of cheese cloth for a two hour little blip on your radar. If you’re cheap like me, you’ll realize this is a crazy thing to do and refuse to do so. So do what I do. Take three paper towels, lightly dampen them, and rubber band them around the top of a bowl. Then use that to strain your yogurt. Use what you got, and feel like you’re in a Bounty commercial in the process. You can also use a very fine mesh strainer. 2. When all the liquid is out of the yogurt, it will almost appear crumbly, more like Play Dough than yogurt. 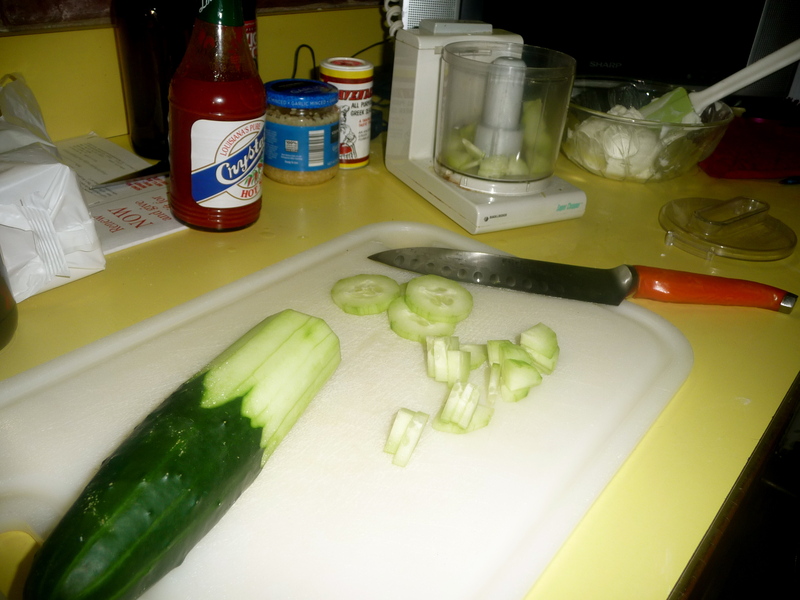 While you wait, take your cucumber, remove the skin, dice it and then run it into a pulp through a food processor. The cucumber is extremely watery, which is okay. That’s why you’ve strained your yogurt! 3. 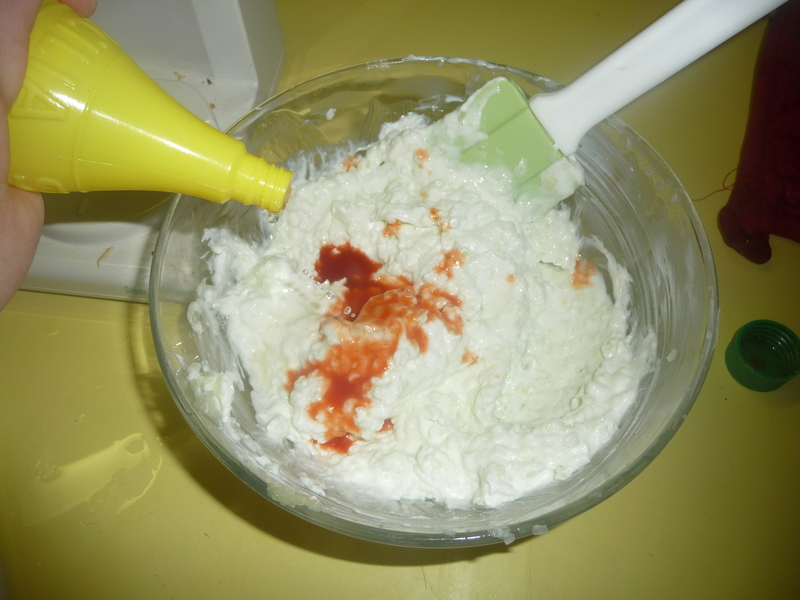 In a large bowl, combine your yogurt, cucumber, hot sauce, garlic, lemon juice and seasoning. Stir and season to taste. Cover it and let sit for about a half hour, or however long it takes to make the remainder of the meal. 1. While the yogurt strains, bring a large pot of water to a boil. 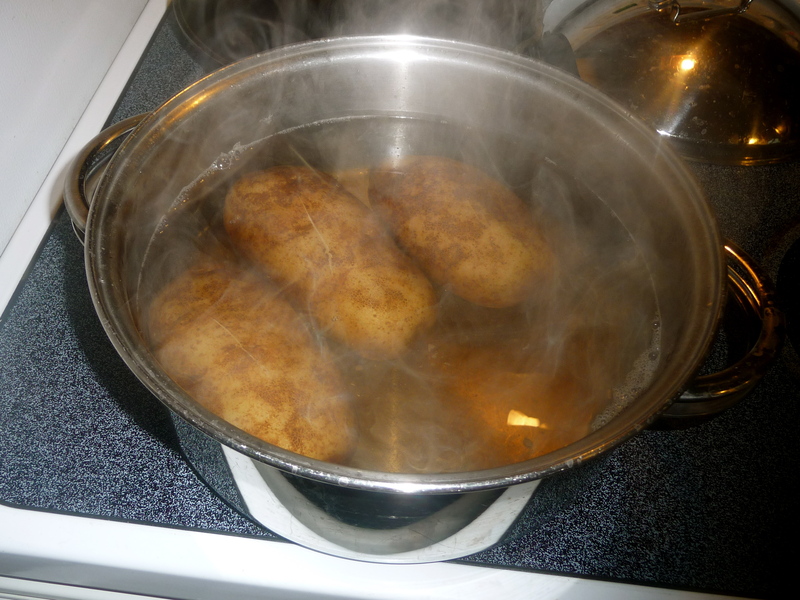 Heavily salt the water, then add your potatoes whole with the skins on and par-boil for about 15-20 minutes. 2. Allow the potatoes to cool, then cut then into 1/10 wedges, or as big as the typical steak fry. Drizzle them with olive oil. 3. Grill wedges until crispy on the outside, then place in a warming oven and season with salt, pepper and malt vinegar if desired. 1. In a large bowl combine the lamb, egg, panko bread crumbs, garlic, onion and spices. 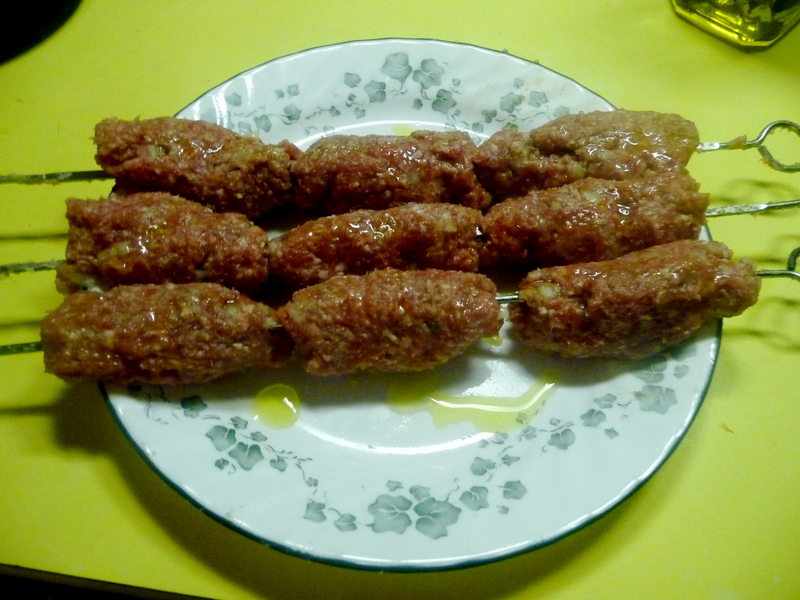 Shape the mixture into a shape about the size of a sausage link and slide the kebabs onto metal skewers. You should get about 9 kebabs from 2 pounds of meat. 2. Drizzle kebabs lightly with olive oil, then grill for about ten minutes on each side or until the lamb is cooked through. Serve with tzatziki, potato wedges, pita bread and toppings and enjoy! Click here for printable recipes! As Easter creeps up this holiday I join a lot of my friends in trying to help put together a menu for family dinners. In large family settings it can be really tricky to find food that everyone can enjoy, so oftentimes the simpler recipes tend to shine. Think about the stars of your holiday meals: turkey, ham, potatoes, all very simple but absolutely necessary for a successful holiday meal. Dessert has always been a challenge for me when it came to holidays. My desire to impress and my love for baking has always trumped the K.I.S.S. (keep it simple, stupid) rule of thumb. I hate the idea of making something as standard as cupcakes or brownies, but I knew for this year I would need something that everyone could enjoy. 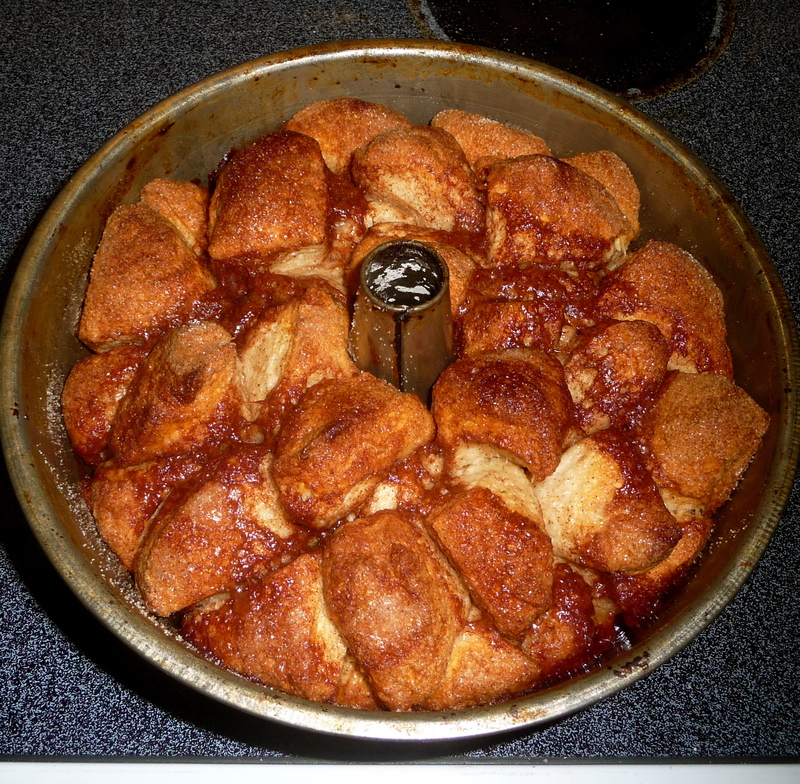 My mom has been making Monkey Bread since I was young, mainly because it’s super simple and crazy delicious. I decided to whip up a batch this weekend, and took my own little twist on it to make it even more successful. If you’re strapped for time and looking for a cheap fix, I guarantee that this will be a hit this holiday weekend. 1. Preheat your oven to 350 degrees. Butter a bundt pant with a small amount of the Land O Lakes butter spread. 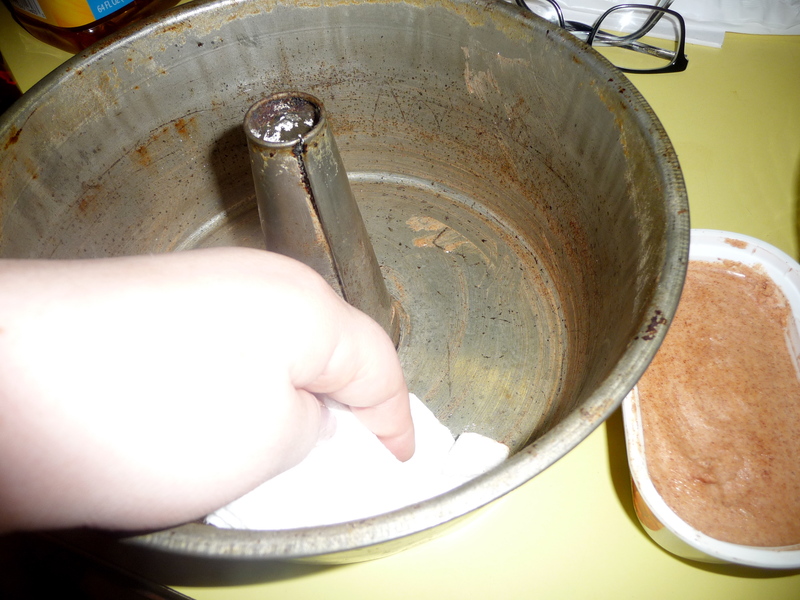 Usually to do this I take a paper towel, scoop a small amount off the top of the tub and rub it in with my hands. It doesn’t matter if you put too much on, as it all melts into the same place, but don’t skimp! 2. 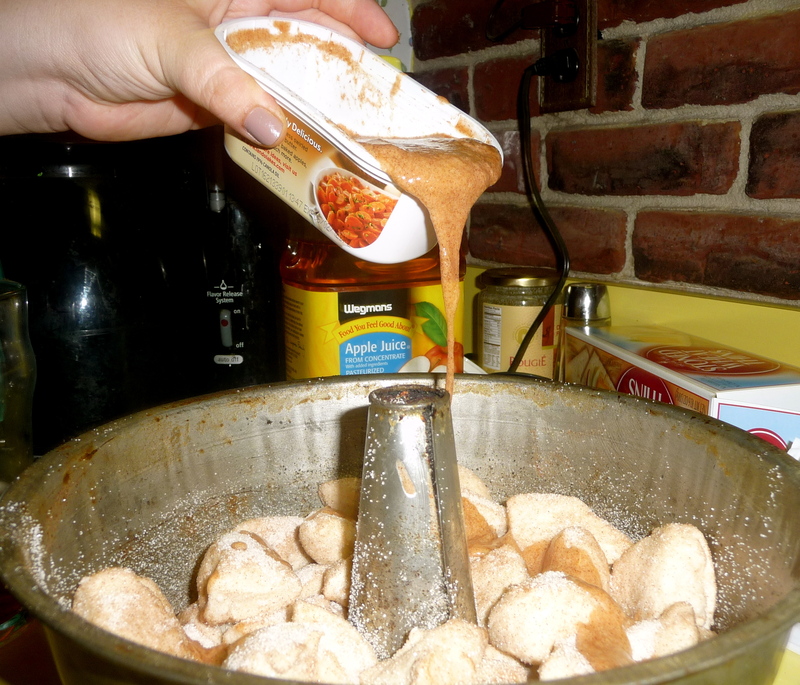 In a large bowl, mix together your sugar and cinnamon. It will look wonderful and light brown and fabulously delicious. I like to make 2 cups of this, keep it in a Tupperware, and spoon it over buttered toast in the morning for a quick breakfast. 3. 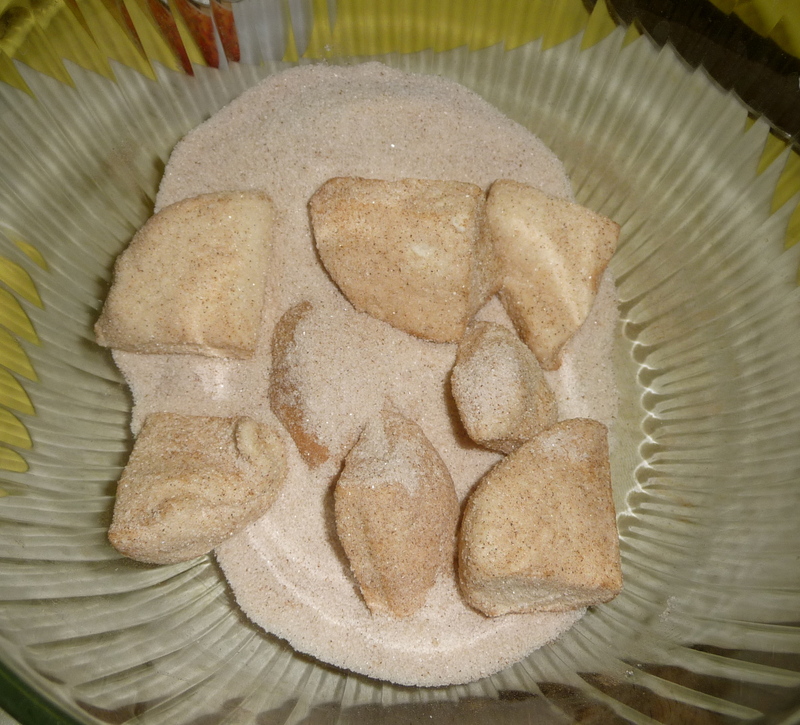 Cut all of your biscuits into quarters and throw them into the large bowl of sugar, completely coating every piece. 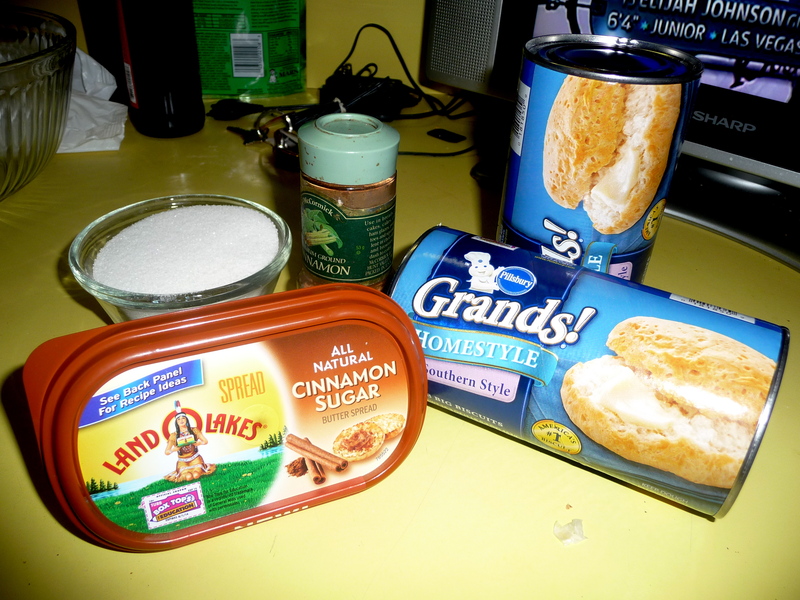 When shopping, make sure you buy the biscuits, not the layered dinner rolls that Pillsbury makes. Drop those pieces into the bunt and repeat until your out of biscuits. 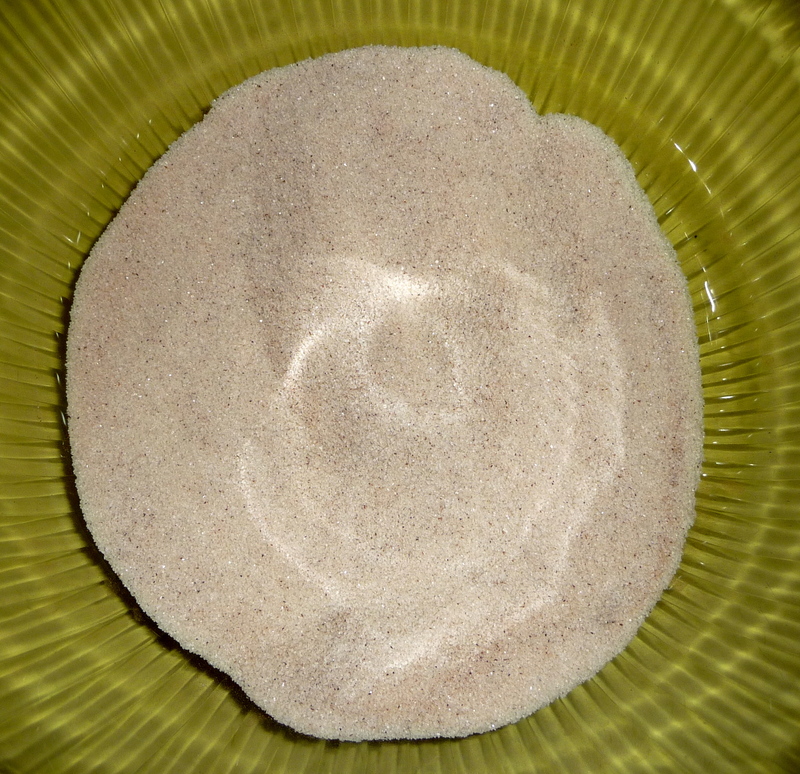 The remaining cinnamon-sugar can be poured over top of the bundt. 4. Melt the remaining Land O Lakes butter spread in the microwave, only for about 20 seconds, then pour that evenly over the top of the biscuits. If you would rather use butter, be my guest, but I found this stuff at Wegmans for pretty cheap and it has changed my world. 5. Bake for approximately 35 minutes. When the top is browned and you think it is done, take it out and examine the open spaces in between, and push down on a few of the pieces on top. If it feels squishy and soft, the inside is raw, but if it feels stiffer the inside is baked. Don’t worry about the top burning when trying to cook the inside. If that becomes an issue (I’ve made this recipe a ridiculous amount of times and I’ve never had that problem) put a piece of foil over the top. 6. 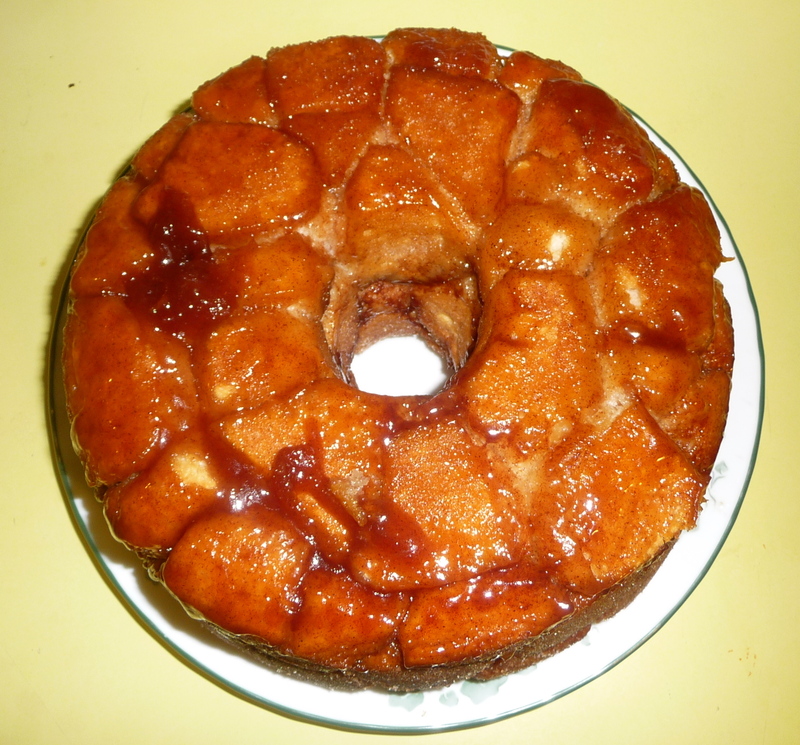 Flip your monkey bread out of the bundt and onto a plate and you’re done! The hardest part will be not grabbing it right away, but remember that it is pretty much covered in molten caramel, so please be careful! And enjoy! Categories Cuisine, Favorites, Try This! Tonight was a tricky night for dinner for Alex and me. It’s Thursday, which is the best day of the week (30 Rock, Community, Swamp People… you get the picture), but it’s also a very, very, very crazy week at work so I’ve been stuck at the office fairly late. Considering that I love Thursdays so much I really wanted to cook a nice dinner, but I needed to find something that was very quick (my Thursday shows start at 8 p.m. AKA way too early) and still very cheap. So a little searching on the FoodNetwork.com and I found my answer. 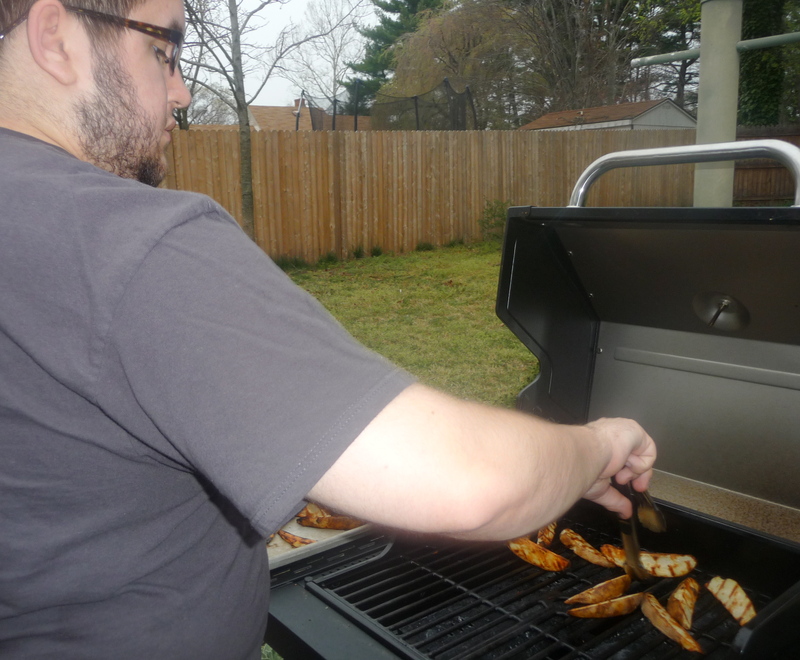 It may be a little bit cold for the spring time in New Jersey, but we still decided to celebrate the season and do some grilling. Peeled, raw, extra large shrimp were on sale at the grocery store, and I almost never eat shrimp for dinner, so Alex and I decided to make Bobby Flay’s Gambas al Ajillo. My favorite vegetable in the world, asparagus, is in season so I knew we had to make that too. 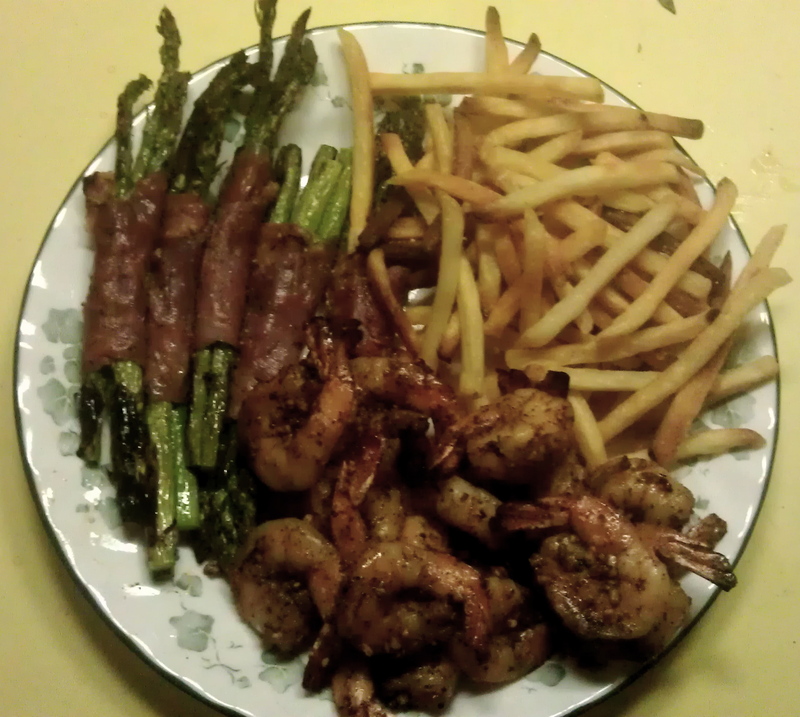 I have been dreaming about grilled asparagus wrapped in prosciutto, and once again I turned to my main man Bobby Flay. Now if you’re having a fancy dinner party or something lavish, stick to Bobby’s recipe word-for-word. If you’re like me and are not trying to buy a million ingredients, simply take your asparagus, snap off the ends, toss them lightly in olive oil, salt and then wrap 3 pieces together in one piece of prosciutto and grill for about 15 minutes. We threw some french fries into the oven as well, but you don’t really need them. Take the fries off the plate and you still have a very full plate! They didn’t really get eaten because everything else was so insanely delicious. Voila, a dinner that took maybe 25 minutes tops. Give it a try! Categories Cuisine, Pictures, Reviews, Try This! I’ve been working with this local family on a story for work, who are without a doubt some of the most remarkable and special people I’ve ever had the privilege to speak to, and my work has led me to research the Jimmy V Foundation and Jim Valvano himself. This might be the best speech I’ve ever heard. What an amazing human being. If you have the opportunity to watch this today you really have to.